November 15, 2011  Hoping to hit on a formula that could vault him back into the top tier of Republican presidential candidates, Texas Gov. 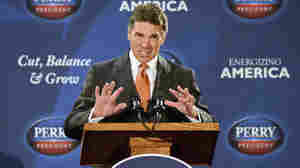 Rick Perry on Tuesday proposed a radical makeover for all three branches of government. 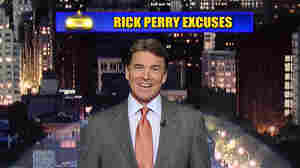 November 11, 2011  On David Letterman, the Texas governor had some fun at his own expense. Excuse No. 10: ""There were three reasons why I messed up last night: 1) The nerves 2) The headache and 3) Um...Uh...Oops." November 10, 2011  His performance at Wednesday night's GOP presidential debate might be the stuff of history — the kind of history that candidates don't like to make. Thursday, he admitted he had "stepped in it" for being unable to remember he wants to eliminate the Department of Energy. November 10, 2011  He wants to eliminate three federal agencies, the Republican presidential candidate said during Wednesday's debate. But he could only remember two. Today, he's saying that just underscores how many agencies there are "that I'd like to forget." November 1, 2011  Has any modern major-party presidential candidate in recent memory ever given a speech that left so many people afterwards asking if he was drunk as was the case after Texas Gov. 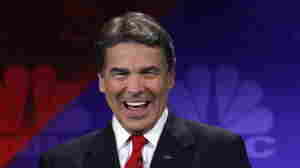 Rick Perry's now infamous appearance in New Hampshire last Friday?If so, that name doesn't come readily to mind. October 27, 2011  In Texas Gov. Rick Perry's first paid ad which went up in Iowa this week, the candidate for the Republican presidential nomination makes a curious statement. He says as president he will create, at a minimum, 2.5 million jobs. But Perry, like other Republicans and Democrats alike, has been quick to say in the past that the government doesn't create jobs. Republican presidential candidate Rick Perry holds up a postcard representing his flat tax plan Tuesday in Gray Court, S.C. Perry toured the factory and then highlighted an optional 20 percent flat tax and a deficit reduction plan. 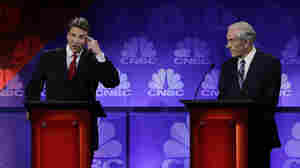 October 25, 2011  On Tuesday, Texas Gov. Rick Perry unveiled his economic platform in hopes of giving a lift to his struggling presidential campaign. 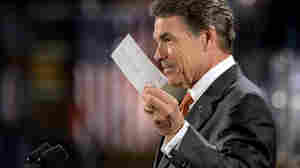 Perry's plan includes an optional flat tax that would let people file their returns on a form the size of a postcard. October 25, 2011  You can apparently never have enough flat-tax plans in a race for the Republican presidential nomination. So Texas Gov. Rick Perry on Tuesday officially introduced his own version. 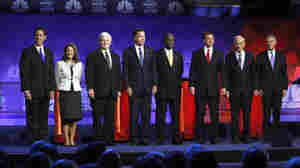 That gives us two flat tax proposals in the GOP race, Perry's and Herman Cain's 9-9-9 plan. Actually, Perry's plan is not so much a flat tax as a flatter tax since he maintains deductions and even the current code. October 19, 2011  In the U.S. when a white man calls a black man "brother" and if they are not actually brothers (think adoption), or in a fraternity, or soldiers sharing a fighting position, indeed, if they are strangers or close to it, many a brotherized black man will immediately feel condescended to. October 19, 2011  With all the time he's had to prepare since 2008, you might have thought Mitt Romney would by now have a more persuasive defense to the charge that illegal immigrants once worked on his Massachusetts property. 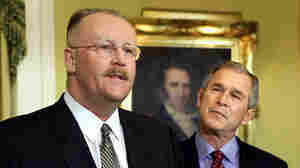 And with all the news coverage the issue got in the 2008 presidential campaign, you might have also thought Texas Gov. Rick Perry would have used the well-documented story sooner.